Grown in our manicured natural tree stands, these traditional looking trees are grown to have a layered natural appearance. They are constantly uniform to assure saleable quality. 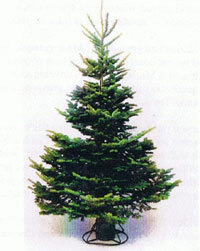 The best bundled grade of tree available anywhere. Trees in this grade have 40% to 60% of the stem covered with at least three complete faces and no more than two minor defects. Trees up to 20' are available on request. Please contact us today for the current price list.